Watching U.S. stocks plunge over 10% in the past 10 days has certainly been a sobering experience for investors. But it’s not the end of the world. U.S. stocks suffered 10% corrections in August 2015 and January 2016 and bounced back quickly both times. This time may be different. Stocks may have further to fall and may not bounce back so quickly, especially if the “Fed put” does not materialize on March 21. That’s the date of the next FOMC meeting. As of now, the Fed is expected to raise rates. But if disorderly markets continue, the Fed could give the market a boost by not raising rates. The Fed is always there with a helping hand when markets head south. But the new Fed chair, Jay Powell, is unlikely to offer the Fed put, at least not yet. He will want to raise rates in March to show that he is not a pushover for market forces. Given that and other interest rate-related head winds, U.S. investors should expect the stock sell-off to continue for some time. Meanwhile, problems in China are even worse. China’s debt-to-GDP ratio, including private debt, is more than double that of the U.S. China also has a trillion-dollar Ponzi scheme run by the big banks called “wealth management products,” or WMPs. As this article shows, China is now trying to rein in and unwind this financial excess. Unfortunately, it’s too late to do that without causing a recession at best or a credit crisis at worst. China is likely to take a start-and-stop approach to its credit problem, which will just let the problem get bigger and make the ultimate credit crisis even worse. 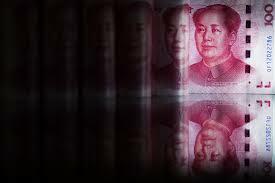 If China does press ahead with reforms, expect a global recession as the world’s second-largest economy applies the brakes.